The skilled nursing center at Elim Park employs specialized staff to provide 24-hour care and supervision in a homelike environment. We work hard to ensure that those who need a higher sustained level of care are comfortable and valued. 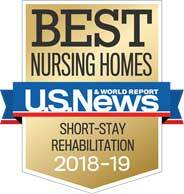 Our interdisciplinary team works hard to stay at the cutting edge of advancements in their field and implement these advancements for the benefit of those who call the Skilled Nursing Center home. Residents are encouraged to stay active mentally and physically with activities such as musical performances and sing-alongs, cooking and baking, iPad programs, Bingo, and even helping to care for our resident ducks and chickens.